Brent Musburger made only one mistake last night when he commented on 2012 Miss Alabama – Katherine Webb, who is also the girlfriend of Crimson Tide’s starting quarterback AJ McCarron. The comment came during the first quarter of last night broadcast of the BSC Championship Game in Miami Florida. At 73 years old Musburger let America know that he is a red-blooded American man. He said what every other red-blooded American man and non-threatended woman was thinking, “this is one outstanding and stunning woman.” What’s wrong with speaking the truth? He was not lewd, crude, crass, belligerent, vulgar, disrespectful, or creepy (as one twitter user put it). He was honest, and very light-hearted. Big deal! 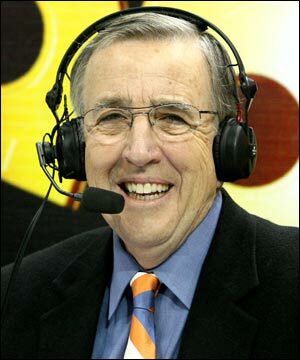 Maybe if David Letterman, R. Kelly, or maybe Brad Pitt, said it, it would’ve been okay by the media….But Brent Musburger…WHOA! Wait a Minute! How oversensitive have we become as a nation, and how hard up is the media to generate drama. Then, to top it off, ESPN comes out with their “skirt” on, and apologizes for Brent. Maybe with that “little skirt” on they’ll look good enough for Brent to comment on them next time. On a side note Alabama CRUSHED Notre Dame 42-14! ROLL TIDE! This entry was posted in college football, sports and tagged AJ McCarron, Brent Musburger, BSC Championship Game, ESPN, Katherine Webb, Miss Alabama. Bookmark the permalink. Why is ESPN apologizing for the announcers comments? Their job is to inform the viewers on the progress of the game, they also have a duty to fill in free time. I’m sure the announcers did not see her in the stands , the producers in the booth must have told them where she was seating. There was nothing sexist or racist with their comments, they were just giving their view points about how good looking the QB ‘s girlfriend was . If that is wrong let’s not have any announcers comment on anything but, the game . Even she said there was nothing wrong with the comments BM made…she was flattered! That bikini picture is kind of transy.